17 main goals, 169 sub-targets and only 10 years time. 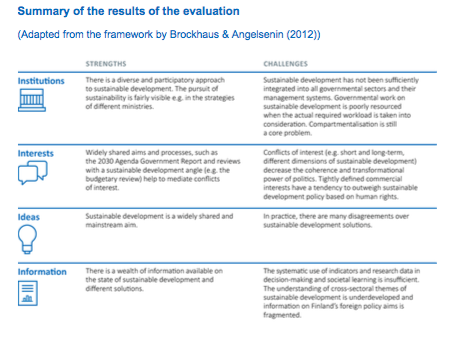 What path should Finland take to reach the UN Sustainable Development Goals by 2030? All UN member states have committed to fulfilling the Sustainable Development Goals by 2030. These goals include for example no poverty, zero hunger and climate action. Finland’s biggest challenges in sustainable development policy are related to climate change, consumption, the state of the environment, and growing societal inequality. 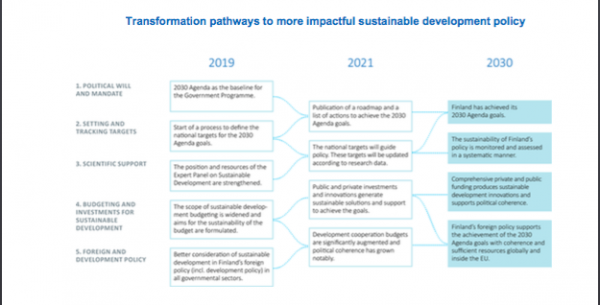 The Path 2030 project evaluates Finnish Sustainable Development policy and offers pathways and concrete suggestions to improve our performance. Sustainable Development has become a largely accepted goal in Finnish society and Finland has excellent assets to advance it. The good education system, strong public institutions and societal stability give us a good starting point to carry out Sustainable Development policy. Finland’s biggest challenges in sustainable development policy are related to climate change, consumption, the state of the environment, and growing societal inequality. Finland should be more consistent in Sustainable Development policy and increase its global impact. In addition, we should be more critical of our current economic system and its capability to create sustainable welfare. – adopt the 2030 Agenda as a base for government policy. – create a national roadmap until the year 2030 in order to strengthen the nation’s ambitions and policies regarding sustainable development. – direct public funds to sustainable development in a more coherent way. – strengthen scientific support and monitoring for the 2030 Agenda. – make sustainable development a fixed cross-administrative part of foreign and development policy. 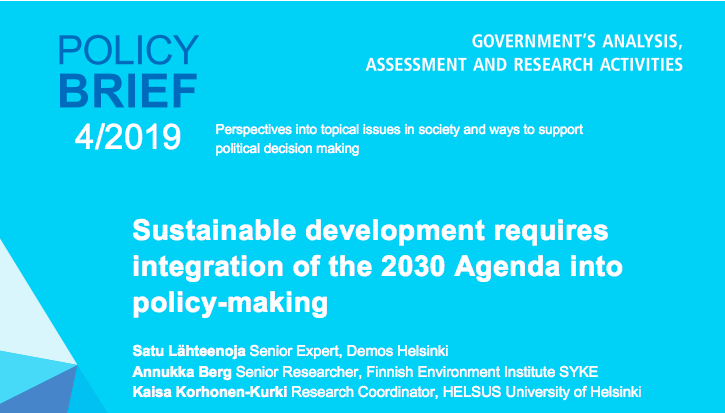 The Path2030 policy brief is co-produced by Demos Helsinki, Finnish Environment Institute SYKE and Helsinki Institute of Sustainability Science HELSUS. A total of 130 experts took part in the workshops and 80 were interviewed bilaterally. The 2030 Sustainable Development goals are achieved #together. Download the policy brief here and be in touch with Demos Helsinki’s One Planet Economy team.